Panic erupted at a packed seaside music festival in northwest Spain when part of a wooden promenade suddenly collapsed, injuring more than 370 people, nine of them seriously, officials said Monday. 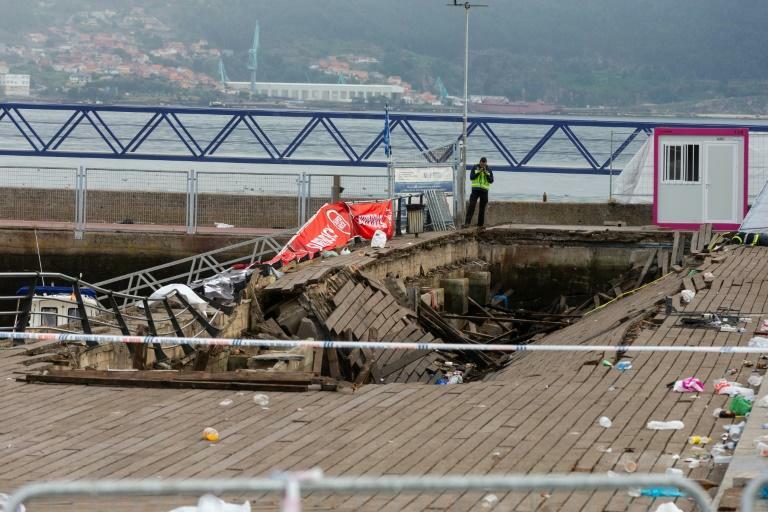 The seafront platform, measuring 30 metres by 10 metres (100 foot by 30 foot), was jammed with people watching a rap artist in the city of Vigo when part of it collapsed just before midnight on Sunday, mayor Abel Caballero told reporters. Rescuers armed with an infrared camera combed the site for three hours to ensure no one remained trapped underneath while divers searched offshore, he said. "Police got the people out of the area very quickly. There were two people who got trapped by debris, firefighters had to remove them and it was not easy to get them out," Caballero told Spanish public television TVE. 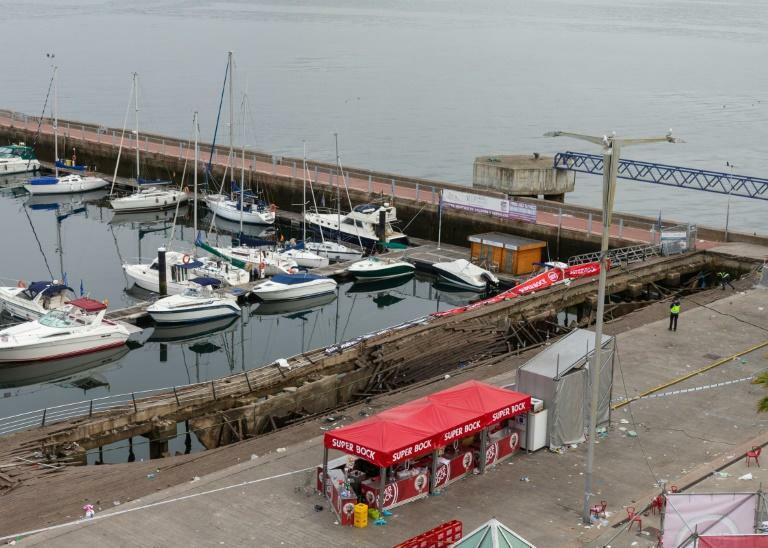 The president of Vigo's Port Authority said he thought the structure, built in the 1990s, collapsed due to "excess weight, to overcapacity". "That is what seems the most likely cause," he told TVE but added: "We are going to order an expert study to see what may have happened,." Local daily El Faro de Vigo said the structure collapsed shortly after Spanish rap artist Rels B told the crowd to jump at the start of his concert. "The floor gave way beneath us as if we were in an elevator. It was a question of five seconds," concert-goer Aitana Alonso told the newspaper. "The platform broke and we all fell. People landed on top of me. I tried to get out and couldn't. My foot ended up stuck in the water but I managed to free it before a guy gave me his hand and pulled me out," she said. "There were people underneath me, shouting that they couldn't get out." A total of 377 people were injured, with seven still recieving hospital treatment, the regional government of Galicia said in a statement. Most suffered light injuries, mainly bruises. Those seriously wounded, including two minors, had broken bones or head injuries but their lives were not at risk, Galicia's regional health minister Jesus Vazquez Almuina told Spanish public radio. "It was the worst moment of my life," said Andres, a young man who was in the VIP area, telling El Faro de Vigo he saw "people crying, others running". In a Twitter message, Spanish Prime Minister Pedro Sanchez expressed his "solidarity with the injured", wishing them a prompt recovery. The head of regional government of Galicia, Alberto Nunez Feijoo, said it was "chilling to see how that entire area collapsed". "The injured, their families, need an explanation," he told journalists during a visit to a Vigo hospital which treated victims of the accident. The concert was part of Vigo's three-day O Marisquino festival, which combines music with competitive sporting events, like skateboarding and mountain biking. The annual festival, which bills itself as the "most important urban sports event in southern Europe", draws some 160,000 people to Vigo, a city of around 300,000 residents. Festival organisers said they "profoundly regretted" the accident and stressed in a statement that the concerts they put on "met the security requirements required by law".